This template contains a selection of symbols with standard lavatory and kitchen fixtures and appliances, door swings, electrical symbols and more. Made of flexible, durable .03" transparent green plastic, it has a matte finish on one side to reduce glare. 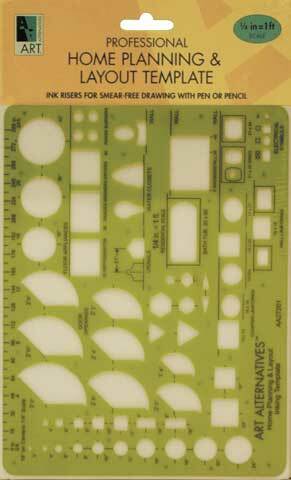 It features ink risers for smear-free drawing, 16" spacing on centers and centering lines for precision placement. The allowance on all openings is designed for use with .5mm pencil lead or pen point. Scale: 1/4" = 1 ft.